I finished my first NRA High Power match last weekend. If you remember, it was a goal of mine a few months ago to start shooting both High Power / CMP and tactical rifle matches with the same AR15 A2. What is the purpose of this? It is to encourage others to take what you have and learn to shoot with no excuses about equipment. I had NOTHING with me but my rifle, case, a shooting mat, and crappy spotting scope. My rifle was not a CMP HBAR match rifle; it started out life as a home built mil-spec A2 Rifle with two modifications: 1) A free float Larue 12.0 rail, and 2) a 1/2 min x 1/2 min Armalight NM rear sight. I wanted to shoot this event with a fighting rifle, so I removed the NM peep and replaced it with a USGI A2 aperture. The 1/2 minute x 1/2 minute sights were more than enough to fine tune my shots. Note: still using the GI aperture and not a national match hood. My goal was to shoot this event with a rifle that I could use hard if the need arises. The next goal is to run this rifle in a tactical rifle competition. That’s the beauty of this platform; you don’t need a specialized weapon to compete in any event. A box stock AR15 can shoot high power and then compete in a tactical rifle match. Don’t be fooled by equipment. You are not in a race. You shoot these events to learn about your rifle. My rifle in all its mis-matched glory at the 200. My first event was a good learning experience. I had nearly no equipment compared to the rest of the shooters. This High Power match was shot at 200 yards standing slow fire (20 rounds – 20 minutes), 200 yards sitting rapid fire (10 rounds), 300 yards prone rapid fire (10 rounds), and 600 yards prone slow fire (20 rounds – 20 minutes). The courses of fire was run while the pit team managed the targets and scoring. I prepared for the event by obtaining a 100 yard zero and then calculating my dope with paper references and ballistic calculator. Shawn from LooseRounds.com provided me some additional resources for my 69 grain hand-loads and a sheet on how to read the wind. This info was in my tan document holder with pens. I also dry fired at home every chance I got. Overall, I did very little in the way of preparation. I ran this event with the minimum of preparation to show everyone out there that you don’t need a 300-400-600 yard practice range to prepare yourself for a High Power competition… you can prepare at just 100 yards. I scored and ran a target with the help of a gentleman next to me, but I was alone on the frame. Typically frames are worked in 2 man teams. 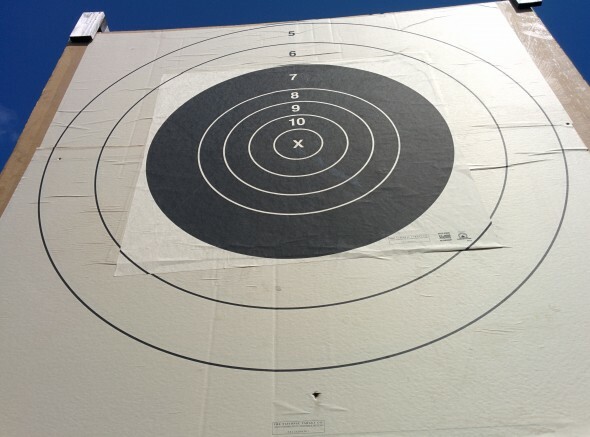 The process during a slow fire course is to pull the frame down after each shot, mark the shot with a spotter disk, repair the last shot with a sticky, and mark the target with a red score disk on the bottom in a U shaped pattern to score a shot. You can score in the pits by writing down your shooters numbers on the official score card, or you can score on the line watching the shots behind the shooter based on the marking disk from the pits. I had to score another competitor from the pits and I was a little confused at first since things had to keep moving despite my questions, but after the first string of slow fire I had an understanding of the system and how I was to pull and mark after each leg. I worked a frame by myself and it was an education that I needed to get. I have a comfortable understanding of the process and there are no more questions. It’s just something you have to do once, and then your done. I went to the competition with a slightly modified Mil-Spec rifle, a cheap spotting scope, and a shooting mat. No specialty equipment other than 69 grain reloads. No shooting jacket. A 100 yard zero is what I went in with along with some wind and ballistic data on paper. I wrote down my dope as I went along. I was not made a fool. I was helped by other shooters. I didn’t let my lack of equipment cower me into staying at home. I didn’t stay at home because, gosh darn it, I don’t have a CMP / high power rifle with a stainless steel match barrel and a leather sling. I ran what I had and I am better for it. I heard other shooters on the line talk of family who has gotten the gear they need to shoot but they feel they are not ready to compete yet. I don’t know where that person is in their marksmanship journey, but I bet they will make massive gains by showing up to shoot instead of practicing by themselves at the range. So get out there. You don’t need two separate guns for two different aspects of the same sport. Be the man with one gun. Good luck with your first match. I am proud as hell of ya. good job. Beware the man that shoots one gun because he probably shoots it well. This is outstanding. I have a mil spec a2-AR15 except with a 6 position stock. Classic rifle length hand guards, mil spec apertures/sights, .07 front post. 77gr handloads averaging 2673fps, 6 lb trigger, 20″ barrel (colt upper) non-hbar. I’m working on being able to do what you did. I don’t want the bells and whistles, and want to be competitive against those who have modified their rifles. I do have a .05″ front post coming this week and will experiment. Question, what kind of spotting scope are guys using to see their holes out to 300 yards, perhaps further? I don’t mind just taking a walk at my club but I understand that in a match this would not be feasible. If your worried about the kind of spotting scope you need for the match, they fill the shots with a spotter disk so even somewhat low quality spotting scopes can see the shot. As far as seeing a bullet hole all by itself at 300 yards, that I do not know. Mine is a budget optic and I wouldn’t be able to see a hole without a spotting disk. Thanks. I’m not “worried” about it per se, but I’ve looked down some pretty expensive spotting scopes and can’t see anything at 300 on the NRA targets. I don’t think paying that much money to see nothing is worth it. What size are the spotter disks in the matches? I could see using a scope for that being useful. Have you been active shooting still since this blog post? Same gun still? In a few weeks my club will start their 300 yard prone matches. Not very competitive but a reason to shoot I guess. I did it last with a scoped rifle and lost by a point to a guy who trains at camp perry – with a savage rifle and hand loads. I don’t have my target still, but I was thinking it’d be sweet to turn in some decent scores using iron sights against the scoped rifles. Probably not realistic but a reason to keep practicing. My stock M16A2 is gone, but I have another setup just like it. Needs some work to get running and a free float rail, but it’s not online as of yet. I have slowed down the shooting with three kids and homeschooling, though I do make it out to multiple events with the same rifle if I can swing it. HighPower is next on the list for my rifle which I shot in a carbine championship. If you can’t do all the sports with one gun, then the sport is too specialized. Where was this? Looks like Carthage, Panola County, but they currently have 16 firing points.